Ⓒ 2018 DQT Ltd. 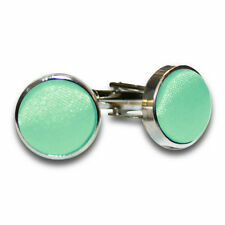 Solid Check Mint Green Cufflinks. Wash Care: Clean Damp Sponge. Colour: Mint Green. Material: Rhodium Plated Brass. Features: Round with Bullet Back Closure, Twist Lock Fastening. Green Jade Cufflinks. Condition is New with tags. Dispatched with Royal Mail 2nd Class Large Letter. 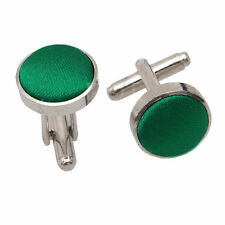 Funky silver novelty cufflinks, with real working green spirit level inside. This unique design will look great when coupled with a smart shirt, and will make the perfect accessory for all occasions. FREE VELVET GIFT BAG - WEDDINGS - BIRTHDAY -14 COLOURS! Quality Cufflinks. You will receive one pair of cufflinks. Very unusual design, in excellent condition. Cuff links man’s vintage Paul Smith. Faced in glazed brass Paul Smith initials on ceramic. Ⓒ 2018 DQT Ltd. Paisley Teal Cufflinks. Matching ties, bow ties, and pocket squares are all available. Colour: Teal. Material: Rhodium Plated Brass. Fabric: Woven Microfibre. Wash Care: Clean Damp Sponge. Green Moss Agate. Hallmarked Sterling Silver. Sterling Silver. See photos. Weight approx 10.4 grams. Set of cufflinks. Manufactured using finest quality silver plating to give a beautiful gloss finish. LONDON T.K.S. NEVER BEEN OUT OF THE BOX OR WORN. TOYE ,KENNING & SPENCER LTD. If you need a gift box,we have stylish quality cufflink boxes for sale. Large Cufflinks and matching tie pin set. The tie pin has a chain which, I think, is inserted into a shirt button hole. Stamped W Germany on the reverse. I would think these are from the 1970's or 1980's. Shades of Blue, Green, Yellow, Purple & Pink. 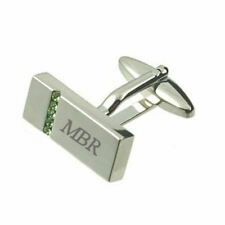 As you can see from the pics they are made to a high standard and are very good quality cufflinks, each one is 25mm wide. Buy 2 Get 1 FREE On All Our Cufflinks! UNIQUE GIFT - FREE VELVET GIFT BAG -18 COLOURS! A fine pair of vintage Art Deco celluloid Cufflinks, 1930s style, featuring attractive green/yellow tones on a brown ground, set off with a scalloped diamond brass mount, one link having more of a yellow tone and the other more green. Condition is Used. Dispatched with Royal Mail 2nd Class Large Letter.